I am using a Lumex 16*2 character LCD Module. 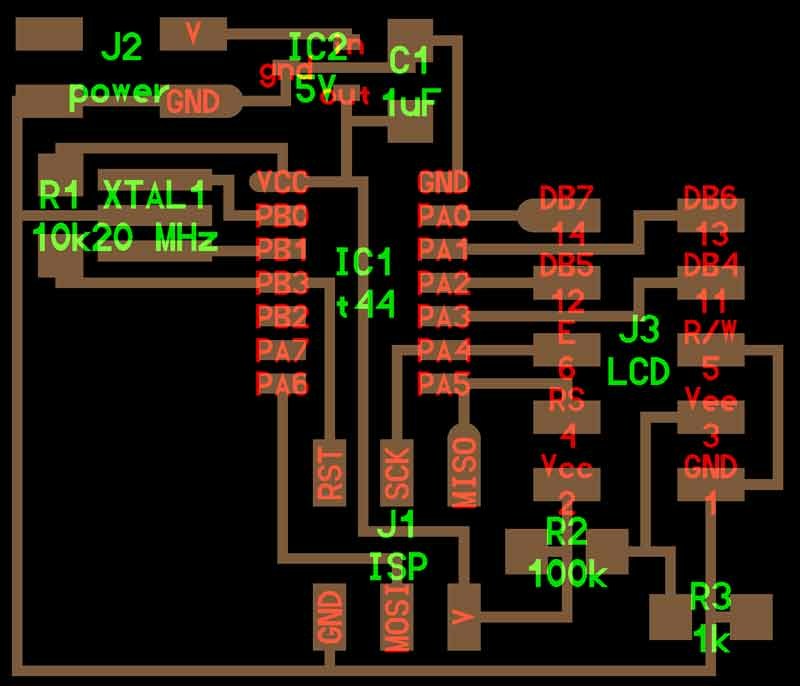 This LCD only requires 5v and six data pins to get up and running. I do not have a PCB with the free pins or proper configuration to use with this LCD. Not a problem however, because I have learned my way around designing, milling and stuffing PCBs. Get it. 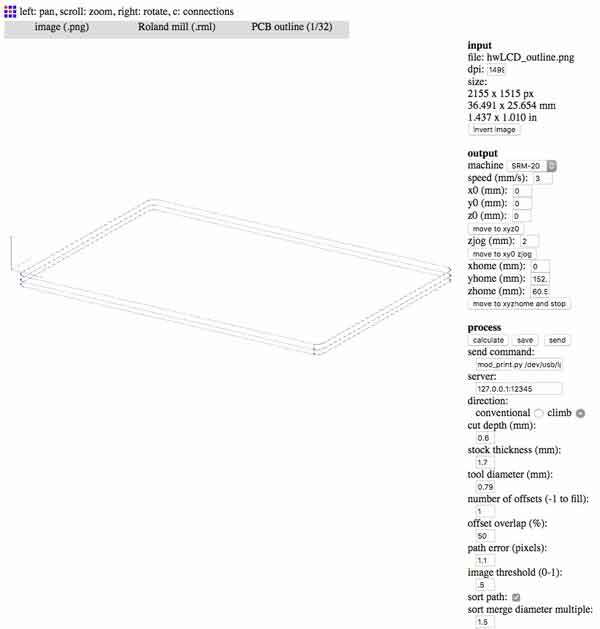 I started by inspecting Neil Gershenfeld's example LCD board. I posted a low resolution copy of the image here for convenient reference. The linked version is better. While following this is great for a beginner like me, I quickly became aware of other methods that I probably would have preferred to use. That is the point of the exercise and the liberation of literacy. 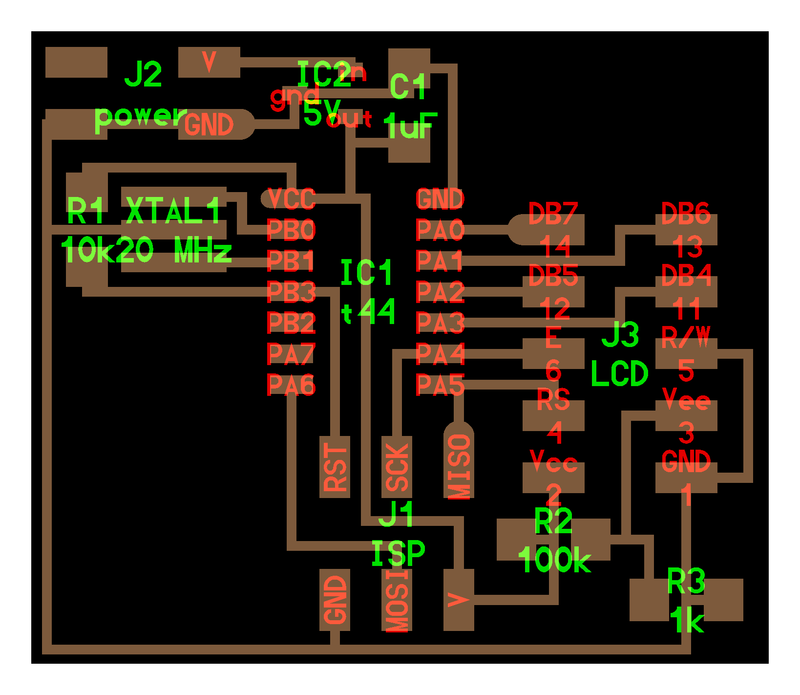 This LCD uses an Hitachi HD44780 LCD controller, and this is the block diagram. I will be using the LCD in 4-bit operation; therefore not connecting to data bus 0-3. You can count the input pins. Answer: ten. From his image I was able to develop a list of electronic components I would need to build my own board. In this schematic, there are two free pins on the ATtiny44, so I added an LED, for future fun. While building the list, I added the components from the Fablab common inventory Eagle library. You can just dump the contents into the schematic window and organize your efforts later. I duplicated my efforts from prior boards in terms of connecting the resonator to the ATtiny44, setting the ISP pins, capacitor, resistor on the reset pin and LED/ resistor combination. Then went about making connections to the 10 pin header for the LCD outputs. And finally, setup a regulator on a the power input. The LM3480 linear voltage has a maximium recommnded input of 30 volts. It will take what I give it and return 5 volts. Thank you. Develop the schematic to a nice level. It does not need to be complete because the board window communicates with the schematic graph. 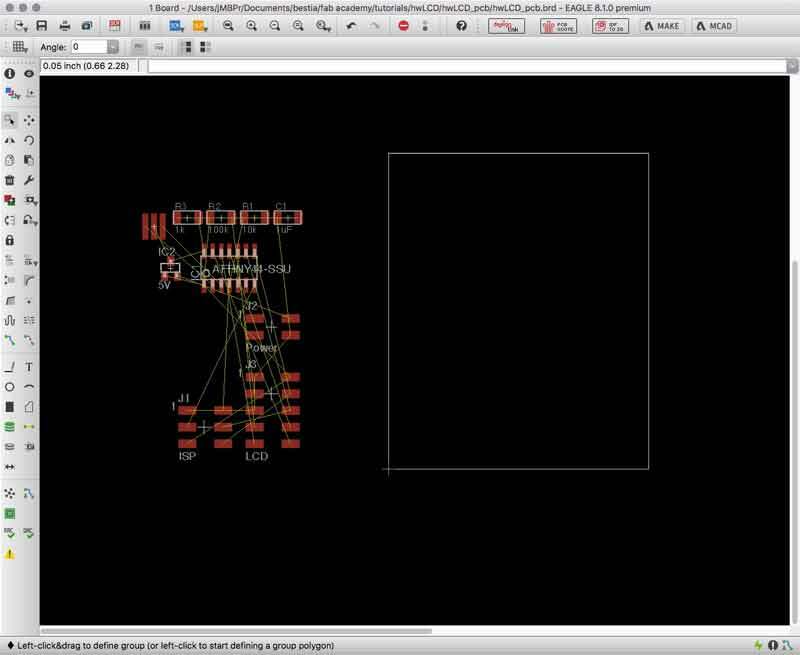 For instance, I completed a board layout with traces and after decided to add the LED. 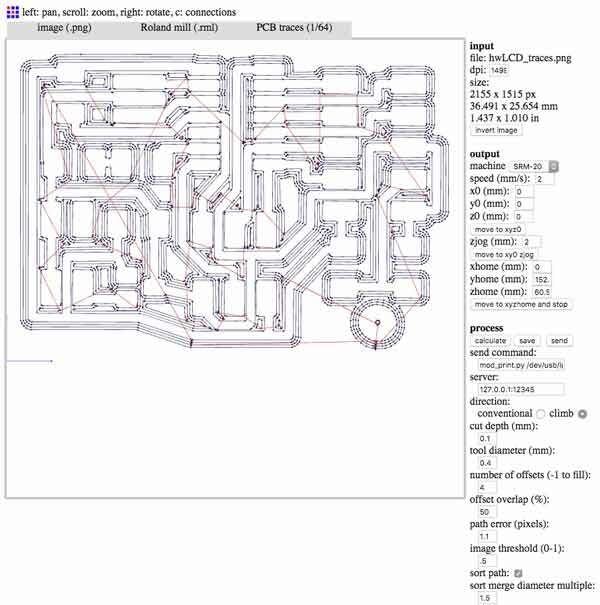 In the beginning, the PCB graph is a mess. Begin organizing your components on the board. 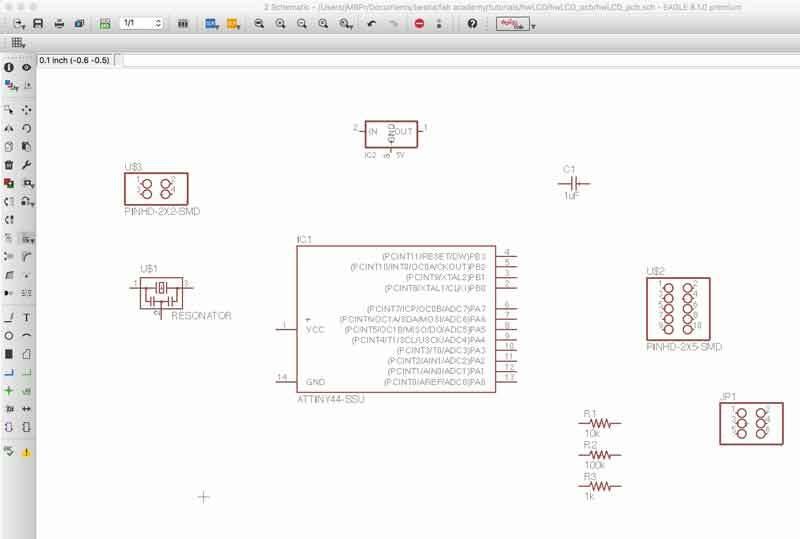 After roughly organizing the electronic compoonents on the PCB graph window, use Eagle's autorouter feature for some quick traces. 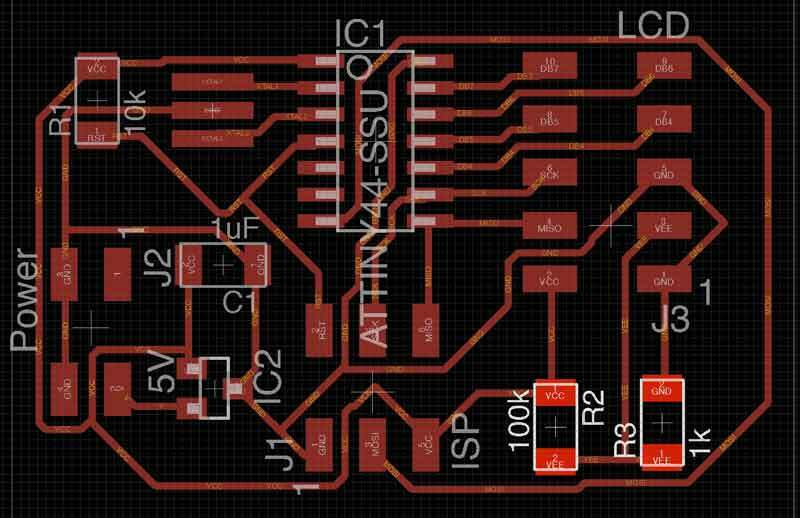 If autorouter develops some 100% functioning layouts, you know you are on your way to the mill soon. 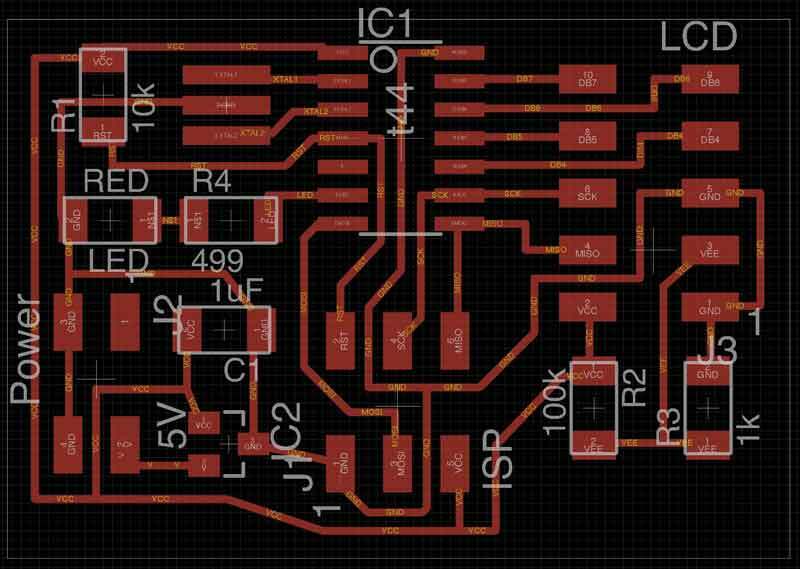 This is my initial organization of the components and one of autorouter's trace layout. While the autorouter traces technically work, there were some inefficiencies that could be ironed out. For instance, the Mosi connection from the ISP to the MCU was odd. And, after getting the board organized, I saw a way I could squeeze in an LED. I could use the extra practice at the soldering table. This time when I exported the PNG and opened in Photoshop for some small edits the size did not double. Other than using a new file, Eagle was recently updated. Perhaps one of those two changes effected the PNG coordination between the two applications. Again, the outline and trace files can be converted to tool paths in the Fab Modules. Double check all the settings before exporting the machine code. Tomorrow, I will mill the board, stuff it, and program this LCD. You can do that too. Download these files. HD44780U (LCD-II) controller : Hitachi LCD controller datasheet. Octopart : Search by part number or keyword, find retailers and informations, ie datasheets. LCM-S01602DTR/M datasheet : LCM-S01602DTR/M LCD by Lumex datasheet. LMs480 regulator : LM3480 linear voltage regulator by Texas Instruments datasheet. Hitachi HD44780 LCD controller : Wikipedia.